The Defining Moments team is delighted to announce the Top 26 winners of the Defining Moments national arts contest! This announcement coincides with the Canada Day launch of the project's Travelling Exhibit — which kicked off in Toronto at Wychwood Barns and here, at the ArtStarts Gallery in Vancouver — that will travel from coast to coast and be featured in locations across the country before culminating in Ottawa for Winterlude in February 2013. Defining Moments: Discovering our Canadian Stories asked youth to explore their experiences and identity living in Canada by submitting their thematic artwork. Throughout the year, hundreds of young people from every province and territory submitted evocative works of art in a variety of mediums that included photography, poetry, painting, installation, video, and song. These talented youth gravitated towards a number of different topics including migration, immigration, memory, nature, sport, health, architecture, political landscape and tradition making for an exciting and truly diverse collection of approaches and discussions on what it means to be living in Canada. Winners of the contest were selected based on their artistic statement as well as originality, execution and creativity. Key considerations were also given to geographic location, age and artistic medium to reflect the mandate of the project. After an extensive jury process that included 5 jury members from across the country, TakingITGlobal is pleased to announce the official Top 26 winners. The artwork by Rosanna Marmont of Montreal, Quebec showcased her exploration of the physical expanse of the Canadian landscape as being integral to her attachment to Canada, by stating "as travelers and later as immigrants to Canada, Alberta's landscape represented something much more ideal. The infinite space and luminous distant horizons were allegories of yearning, of greener-grass on-the-other-side, of new beginnings." Alanah Correia of Halifax, Nova Scotia used photography to comment on the importance of providing opportunities to youth in Canada to enable them to fulfill their potential; "[my piece] is a photograph about how youth have the potential to take things, their future, their lives, into their own hands, but may not know they have this power. Luckily I've been able to find this potential in myself, and hope others can find it in themselves." Congratulations to the Top 26! We should like to extend a big thank you to all those who participated in the contest and contributed their insights to this ongoing discussion. To view the winning artworks and their accompanying statements, please visit the online collection at www.canadianmoments.ca/top26 ... and of course stop by the ArtStarts Gallery to see the exhibition in person! The exhibition runs until August 31st: click here for our hours or to book a free tour. 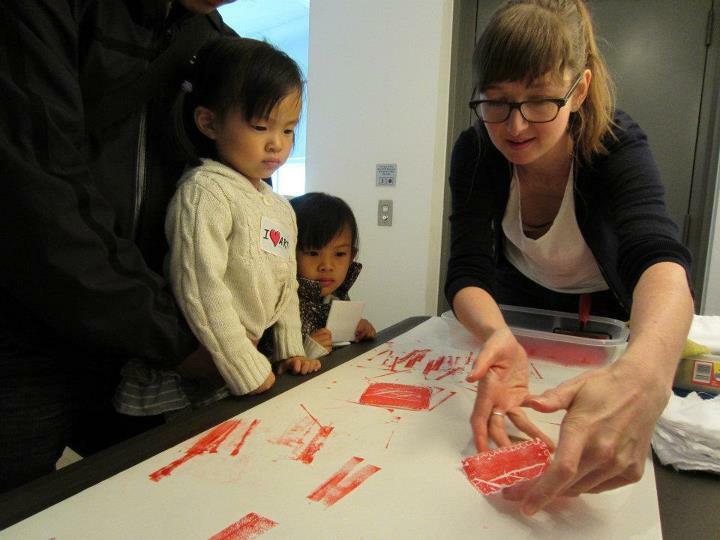 At ArtStarts, we celebrated the exhibition opening on Canada Day by eating cake and making some art! (How can you resist that combination?) We were pleased to have some of the winners in attendance at the event, including Camille Forest, author of the poem, A Long Grey Summer. 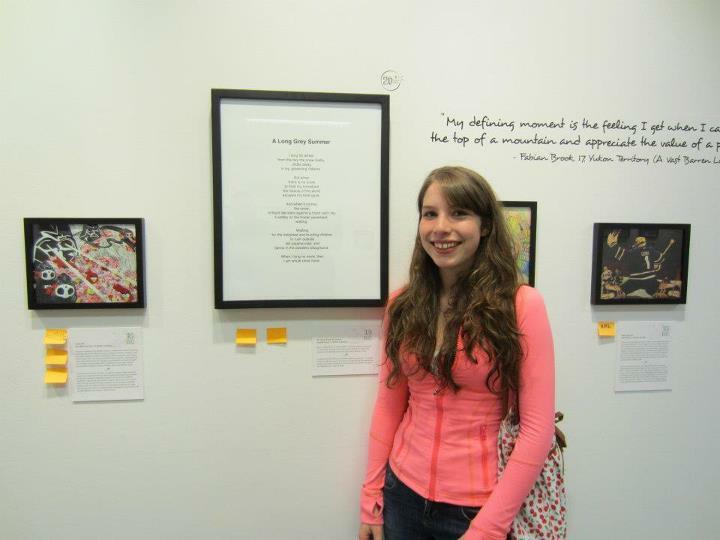 Her piece placed 20th in the whole country! Congratulations, Camille — and thanks for coming out to celebrate with us! Check out some photos from our Canada Day celebrations on Facebook. The Top 26 collection will be part of the Travelling Exhibit which will go on a tour of the country before culminating at Winterlude 2013 in February. From this group of winning pieces, thirteen artists will be given the opportunity to attend Winterlude in the Nation's capital in February 2013 for 3 nights and four days courtesy of TakingITGlobal and the National Capital Commission. Each of the Top 13 will receive a digital camera to document their stay in Ottawa along with a prize pack courtesy of our sponsors (Best Buy, Pearson, and Adobe). Youth are encouraged to continue adding to the Defining Moments online collection by submitting their artwork via the art contest page. Defining Moments is a project by TakingITGlobal that has been made possible with the generous support of Canadian Heritage. ArtStarts would like to thank Boeing for their generous support of the Defining Moments exhibition.